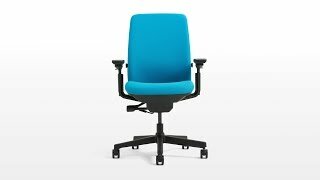 Enjoy the Steelcase Amia Chair even sooner! This ergonomic chair is now available with a same day ship option. A favorite for a reason, the award-winning Amia delivers a collection of supportive ergonomic features, such as Steelcase's revolutionary LiveLumbar technology, a flexible front seat edge, and four-way adjustable arms. This technology is packaged in minimal, modern styling that takes up less space in your work area, up to 30% less space, to be more exact. Its adjustment range makes it an ideal fit for most petite users and users up to 400 pounds, letting offices all over upgrade their seating situation quickly with one chair. If you're eager to start sitting in one of the most comfy chairs that gives you health benefits like better circulation throughout the body, Human Solution is ready to offer this basic black configuration for immediate shipment. Call us for a quote today!